Make the most out of Valentine’s Day this Year! Valentine’s Day has become one of the busiest days of the year. Even though this holiday doesn’t bring such shopping fever as Black Friday or Christmas do, annual spending on Valentine’s day is steadily growing. The amount of sales on this day is huge, surpassing $18 billion worldwide! The average spending on St. Valentine’s is estimated at around $136 per person, including both in-store and online purchases. Of course, a dinner out, candy and flowers rank among the top most popular gifts on this day. However, more and more consumers prefer to shop online rather than spend hours wandering around malls in order to pick up perfect gifts for their loved ones. Thus, St. Valentine’s brings a great chance for online merchants to attract new buyers and, this way, increase their sales. Since February 14th is just around the corner, it’s high time you got your marketing strategy ready for the big day. In our recent article, we discussed how to help customers find a perfect Valentine’s gift at your store. 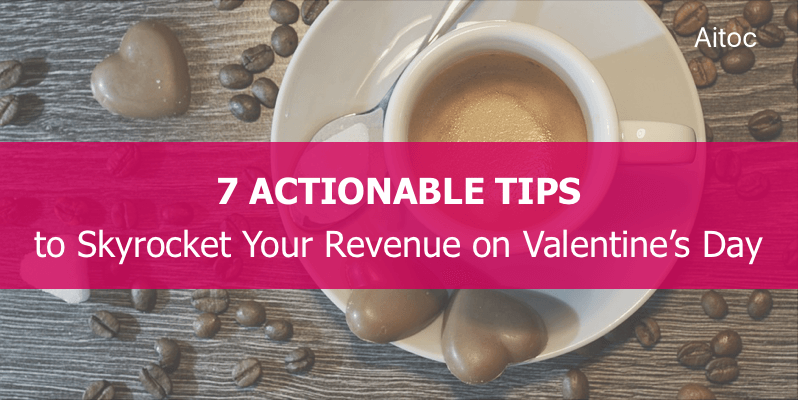 Now we share some useful tips on how to get your store ready for St. Valentine’s Day and capitalize on this wonderful holiday. The beauty is in the details, especially when it comes to St. Valentine’s Day. Conventional brick-and-mortar shops invest heavily into store decoration to lure customers with festive show-windows. Ecommerce businesses can make use of this idea too. 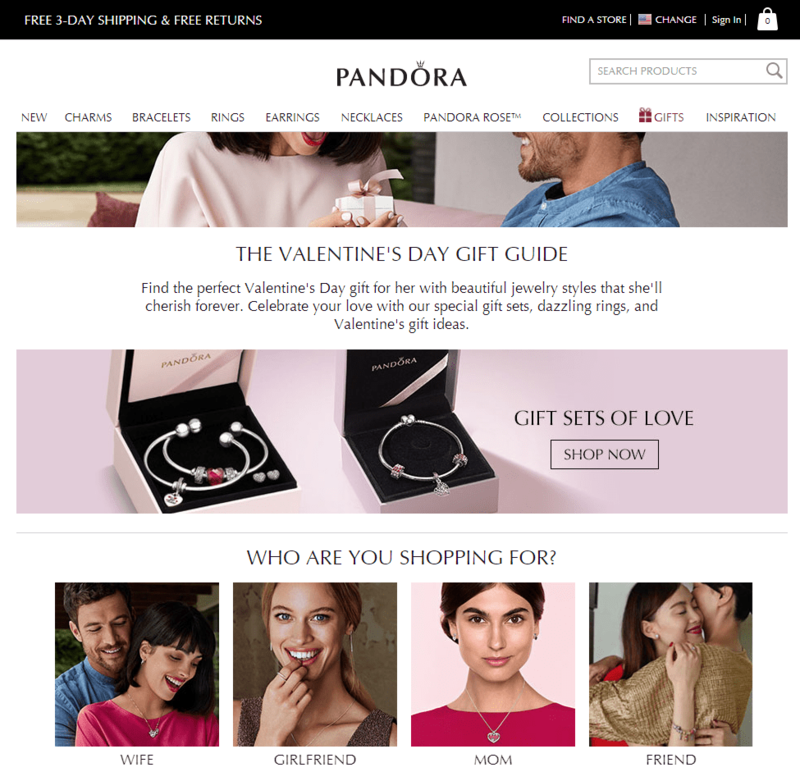 Add a touch of romance to your website by changing the theme to the Valentine’s-inspired one. You can use an appealing graphic skin on your homepage to instantly grab your customers’ attention and bring that romantic vibe to it. Or even create a special microsite with Valentine’s exclusive offers and deals. There’s no need to go all pink and put hearts and kisses on every product page you have! Just show your buyers you care about this special day and have some great deals to offer. Email marketing has proved to be one of the most effective tools for targeting, engaging, and retaining customers. 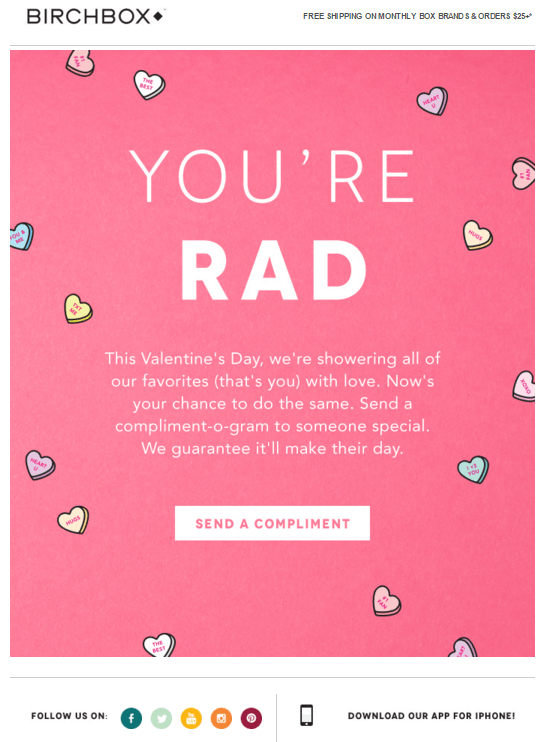 Launching a Valentine’s Day email campaign is a great idea if you want to give extra attention to your audience. Create a custom email template, add a compelling subject line and say a few kind words to your recipients. A little note will spread the holiday cheer in the best way. Don’t forget to offer a special deal or a discount in your message. This will increase the chances that your customers to check out your shop and make a purchase. Finding a perfect present is hard. Sometimes we doubt whether our special person will love it, struggle to choose one out of many, or simply don’t know what to get as a gift. Here is where gift guides come to play! Inspire your customers with some creative ideas and help them make the decision by publishing Valentine’s Day gift guides that feature the products you sell. To make it all work properly, segment your target audience by splitting it into groups based on, say, gender or specific interests. And then create gift guides for each one of them. A few examples include ‘Valentine’s Gift Ideas for Her’ and ‘Valentine’s Gift Guide for Vegans’. You can also be more specific and offer a guide with gifts under a certain sum of money like ‘Valentine’s Gifts under $15’. The easier you make the gift-giving for your customers the better. Valentine’s gift cards and vouchers are yet another effective means you can use since they provide the freedom of choice for the owner. Apart from facilitating the purchase decision-making process, gift cards also open up additional promotional opportunities and increase brand awareness. So, implementing such a tool on this St. Valentine’s Day is a wise idea. Amazon offers an entire range of e-cards that can be used for St. Valentine’s day. Gift wrapping is a perfect way to both provide a great shopping experience and get additional revenue. On Valentine’s Day people tend to purchase gifts online and send them directly to their loved ones. A gift wrapping option is a life savior in this case since it allows buyers to get their presents wrapped remotely. By enabling gift wrapping, not only you can enhance your customer service, but also increase the average order value. You can also provide the ability for shoppers to add a personalized note or a card to the gift. Your customers will definitely appreciate that you are ready to go the extra mile. Prior to any holiday consumers are all busy with choosing and buying gifts. But who doesn’t want to get a free gift for themselves? Hosting a giveaway on a website or social media provides an excellent opportunity to engage the community and support your Valentine’s Day marketing campaign. Even if online shoppers do not aim to buy something in your store, they still can participate in the giveaway. This can help you spread the word about your brand, as well as gather valuable customer information (for instance, emails) for the further lead generation. And the last but not least. Timely delivery is highly important, especially on such a special occasion like St. Valentine’s Day. This wonderful holiday may turn into a complete disaster if a gift is not delivered to the person it was intended for on time. So, if you want your customers to be fully satisfied with your service (we bet you are! ), make sure to arrange on-time order shipping and delivery. Contact your delivery service and double-check all the arrangements to eliminate the risk of shipment delays. Now that you have some nice ideas on how to prepare for this St. Valentines day, here is a set of Magento modules that can assist you in your endeavors. Follow-up Emails for Magento 2: Take advantage of this extension to set up an email marketing campaign for this Valentine’s day. Create a unique holiday-inspired email template and send it out to your subscribers automatically. Pre-Orders for Magento 2: Allow customers to pre-order out-of-stock or soon-to-be-released products at your store prior to St. Valentine’s day. Charge your clients as if they were buying products as usual and notify them when these products become available. 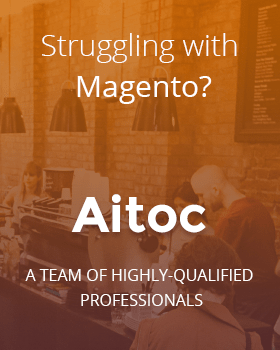 The plugin is also available for Magento 1. Gift Registry for Magento 1: Let your customers easily create, edit and share multiple gift registries in your Magento store. Besides, you can manually create gift lists FOR your customers in case they place an order over the phone or in person. Gift Wrap for Magento 1: Allow your customers to opt for an additional service like gift wrapping for an extra fee while they are finalizing the purchase. You can charge them a fixed amount or a price percentage for your extra services. The holiday season provides an outstanding opportunity for online retailers to increase their profits. If planned and executed effectively the Valentine’s Day marketing campaign can bring in new customers and turn the existing ones into true brand ambassadors. We hope that our tips will give a boost to your holiday campaign on this Valentine’s Day.